With me working the night shift, and not being able to fix my little one's hair in the morning, I have to frequently resort to long-term protective styling for her. This time around, I was pressed for time, she needed her hair done and I had some Marley hair at home. Installing Marley hair only involves parting out the section and twisting as opposed to cornrows that require a more complex parting and more time doing the cornrows. As shown, her hair was parted very big. She only has 32 twists. Each twist was made with three strips of Marley hair but the edges were done with two strips. I used the invisible method, AKA, twisting from the roots. I used yarn to "corkscrew" her ends and dipped them in hot water for a subtle curly look ( I was very careful and she was so mature about it). I am hoping these will last for three weeks due to the size. As always, I do not wash this kind of protective style. Her hair was washed and pampered before these were installed. So her hair can survive without being washed for the next three weeks. I will certainly keep her hair moisturized on a regular basis. What about you? Do you have kids and how do you style their to protect it from frequent manipulation? Thanks for visiting! Till next time, take care and God bless! Her hair looks nice. My 1 yr old daughters hair is still too short and too slippery/soft to be styled. Though I managed to thread her hair using yarn once, she kept pulling on it till half her hair was undone. I had to take out the hair which lasted less than 24hrs! I have decided not to put pressure on her hair, so I'll let it be (besides washing and moisturising) till its long enough to braid. Yes.. That is what u did with my daughter's hair when she was much younger: left it alone. Their hair is not strong enough to handle manipulation at that age. Meant that us what I do to my daughter's hair. I recently did a set of these on my 6 year old and we absolutely loved them. I like the two ponytails in her hair. I am sure it looks great on her. 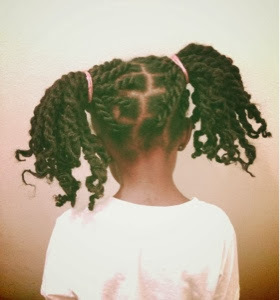 I think these big twists are practical for little girls: saves time and are gentle on the hair. My daughter's hair is fine just like your daughters, and braids extensions make her hair break, how do you prevent this from happening with your daughter, thanks. I don't braid to tight and I only keep them for a month and I moisturize regularly. If your baby's hair is breaking from using extensions, then don't use them. I did not start using extensions on my daughters hair until she was almost four. Also if you must use extensions, when you take them out, use conditioner with great slip on her hair before you manipulate her hair. Fine hair tends to break easily if manipulated dry. Please feel free to ask more questions if you need to. If you want, I could make a video wen no am taking her extensions out and when I install a new set.